It was March 20, just on the vernal equinox, as we sped toward Yosemite National Park, just over an hour’s drive from California’s Central Valley on Highway 140. The low, rolling foothills merged into the Merced River canyon as we gained elevation. As we drove along, the mountainsides grew higher and more rugged, when suddenly a giant leaned down and painted the hillsides with a brush full of orange and pink. Vivid orange California poppies washed across the hills, and the upward-shooting branches of thousands of redbud trees were bursting with brilliant, magenta-colored bloom. We slowed down. Fortunately for the vehicles behind us, the traffic was light on this midweek day, and they zoomed around us as we poked along. We pulled in at Savage’s Trading Post, a souvenir shop. Next to the shop is the trailhead for Hite Cove Trail, famous for magnificent wildflower displays. We headed up the narrow, winding footpath above the South Fork of the Merced River. Once you get used to the dizzying drop-off above the river, the flower show lives up to its reputation. We stopped counting after about forty species of flowers — streams of magenta-colored owl’s clover; stalks of vivid purple and pink Chinese pagodas; purple and white shooting stars, bright red Indian pinks. I sat down under an oak tree by a mossy seep, where icy water trickled out of the rocks into a mass of delicate, pale blue waterfall buttercups; baby-blue eyes and brilliant, lavender-purple fiesta flowers. Smooth ivory globe lilies with rosy caps nodded in the breeze like fairy lanterns. My husband snapped a photo at every turn in the trail until the sun was high overhead, and we turned back to resume our drive to the park. We entered the National Park through Arch Rock, following the boulder-strewn, tumbling river filled with snowmelt. As we passed between El Capitan and Bridalveil Fall, I was already weepy at the sheer magnificence of the place. A startling phenomenon of nature, barely half a mile wide and seven miles long, Yosemite Valley is lined by bare granite cliffs and spires, domes and towers created by millions of years of glacial activity, forming a view corridor so unique that its sentinels claim their own names — Half Dome, Cathedral Spires, Sentinel Rock and Royal Arches, their feet in flowers and aromatic evergreens, their pinnacles in heaven, luminous in the clear air of the Sierra Nevada mountain range. 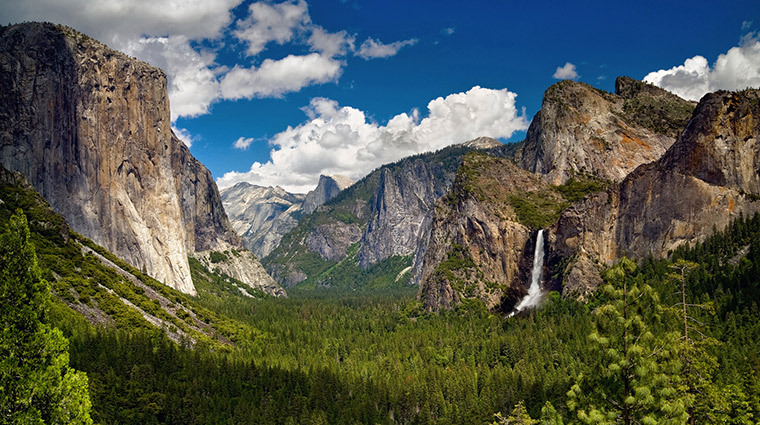 Springtime in Yosemite is when the world-famous waterfalls are at their peak. Snowmelt fills the Merced and Tuolumne Rivers, roiling recklessly down the canyons and dropping over clifftops into the valley. You can hear it thundering from Nevada and Vernal falls, and feel it vibrating under your feet at the bottom of Lower Yosemite Fall. 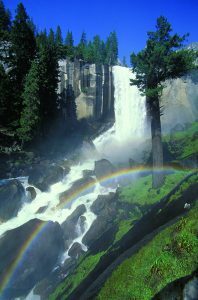 The sound and sight of water is one of the great pleasures of Yosemite Valley, from its thrilling waterfalls to boggy meadows along the riverbanks, vernal pools and misted forest glens. On both sides of the Merced, the lower valley is undeveloped, for the most part, an enchanted world of meadows, woodlands and fields of boulders as big as school buses. Clustered around Yosemite Village in mid-valley are the lodgings, campgrounds, historical museums, theaters, retail outlets, restaurants and the Visitor’s Center. We began our springtime expedition at the Visitors Center by picking up a map and renting binoculars. After lunch under a spray of white dogwood blossoms on the deck at Degnan’s Cafe, we wandered on the boardwalk crossing Cook’s Meadow, a vast, wetland lush with grasses two feet high and scattered with wildflowers. Western azaleas were a dazzling white background for lavender shooting stars and yellow-gold sneezeweed. As picturesque and as cooling as Monet’s water gardens were the dinner plate-sized floating leaves and yellow flowers of the Indian pond lily. Cow parsnips stood tall with lacy white flower heads a foot wide. In recent years, the larger meadows have been fenced and boardwalked, and non-indigenous flora have been removed. This protection of the habitat has resulted in the reemergence and flourishing of indigenous trees, such as black oaks. The springtime torrent of Lower Yosemite Fall. No hiking required! A must-see in spring is Lower Yosemite Fall, a mighty leap of frigid water exploding from the base of the upper fall. Together, they comprise the tallest waterfall in North America — 2,425 feet — a tremendous force of 144,000 gallons of water per minute in at this time of the year. If the hiking trail is clear of snow and you decide to climb the 3.5 miles to the base of the lower fall, bring a parka for the cold, drenching spray. 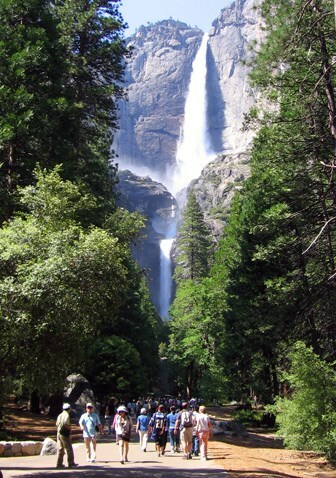 The delightful, fizzy spray of Lower Yosemite Fall is best in spring; by August, it may be just a trickle and a mist. Rambling through the valley in a rambunctious stream, the Merced River is fast-flowing most of the year, overarched by feathery willows, alders, bigleaf maples and other riparian flora. We walked along the riverside trail about 2.5 miles, from Yosemite Valley Lodge to El Capitan Bridge, dodging patches of snow in the shady spots, mesmerized by reflections in the water of the new-green, budding willows and cottonwoods. When the rush of the spring thaw has calmed in mid-summer, canoeing and rafting are popular, and sunbathers gather on the narrow sand bars. With pools and riffles purely translucent, fishing is not easy, as the trout can see the fisherman. 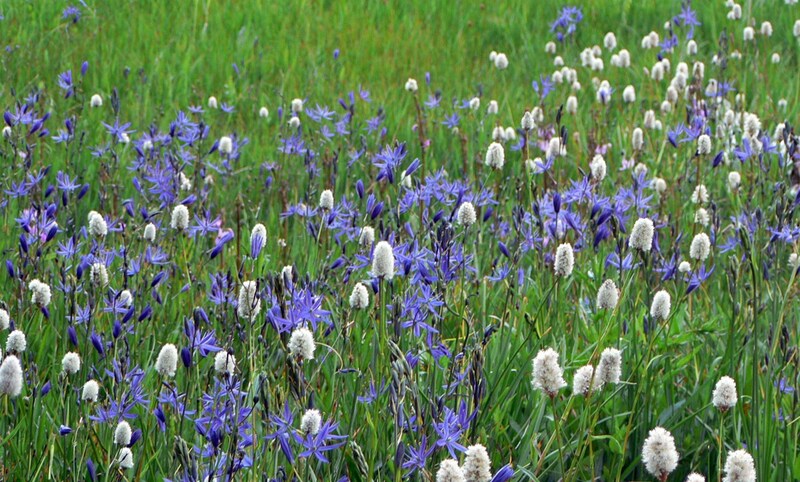 Surrounded by oceans of wild blue iris, we rested at El Capitan Meadow. This is the best vantage point from which to watch climbers on the massive wall of El Cap. Nearly every day of the year, except during storms, climbers can be seen making their ascents to the 3,593-foot summit, clinging to the vertical mass of silver-white granite, four times as large as the Rock of Gibraltar. El Cap and the other photogenic monuments around the valley are remnants of an ice age when glaciers tore off and ground into bits great sections of mountain. Just past El Cap on the left, an apron of rocky moraine remains from the last glaciers in the valley. Another two miles or so at the west end of the walking trail are good viewing spots for Cathedral Spires, Ribbon Fall and Bridalveil Fall. The highest single fall in Yosemite, Ribbon Fall descends 1,612 feet in a narrow flow from the northwest rim of the valley. I also discovered dogwoods in the meadows behind the Majestic Yosemite Hotel (formerly the Ahwahnee Hotel) where we stayed. A masterpiece of Art Deco and California Craftsman styles, the massive stone, concrete and redwood edifice stands in splendor at the foot of Royal Arches. 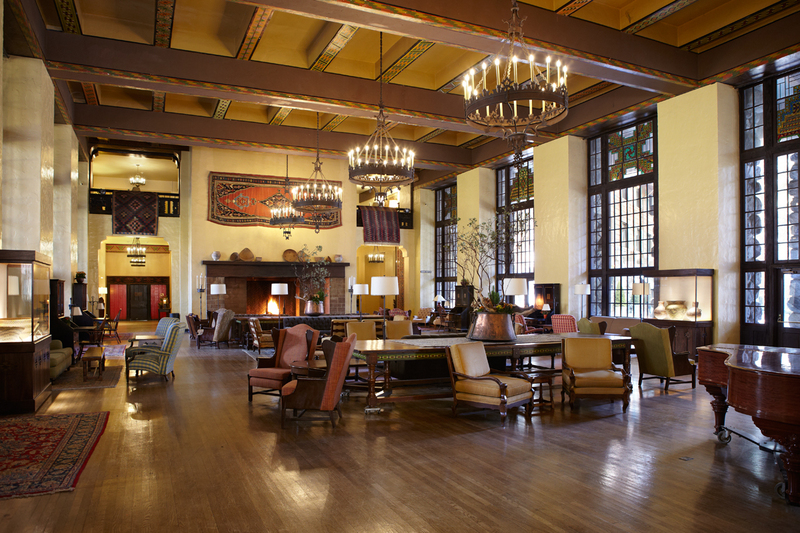 Designed by the architect of Hearst Castle, Julia Morgan, the hotel has a cozy, vintage lodge feeling inside, notwithstanding the lofty beamed ceilings. In the Great Room lounge, Native American-design rugs, antique basketry, art and artifacts all glow in the light streaming through three-story-tall, stained-glass windows. Visitors wander around, agog at the tremendous walk-in, sandstone fireplaces and wrought iron chandeliers big enough for a castle. The colossal dining room is ready for King Arthur’s entire court. Even if not a guest here, you can enjoy the restaurant, the bar, and the lobbies, and in the Great Room, you can read and warm your toes by the fire. We like to hide in the snug Mural Room, with its brass fireplace, and a wall-length painting by Robert Boardman Howard that depicts local flora and fauna in a style reminiscent of medieval tapestries. Two armchairs sit in front of a window with a view of Upper Yosemite Fall and a grassy clearing where deer graze in the wild strawberries. Done up in “mountain lodge” style with oakleaf-motif fabrics, our favorite guest rooms are north-facing with views of Royal Arches, a striking, striated slab that shows how glaciers broke off layers of granite in a process called exfoliation, leaving rounded sheets and strips parallel to the valley floor. A 1,000-foot waterfall to the left of the arches adds to the beauty in springtime, while skyscraper-like Washington Column looms, 1,920-feet high, on the right. Behind the column in the near distance, North Dome echoes the arches’ geologic formations. to call it “the fall of the puffing winds.” An elongated pyramid rivaling those in Egypt, Cathedral Rocks forms an impressive backdrop to the scene. In late afternoon until just before sunset, the light on the cliffs and the fall can be golden and ethereal, especially in March and April. Below the fall, the lower part of Bridalveil Creek flows into several beautiful channels under three rustic stone bridges, which were constructed in the 1920s and ‘30s. Just east of the parking lot beneath the cedars, look for displays of rose-pink, heart-shaped Western bleeding-hearts. 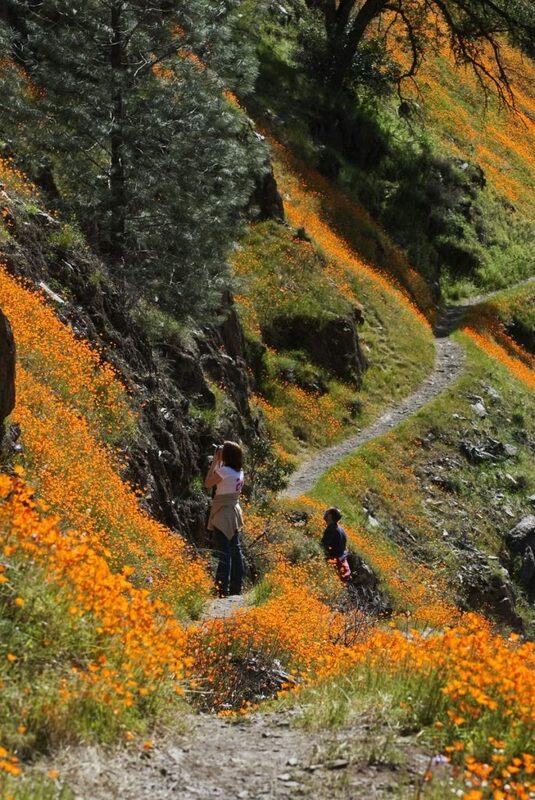 At the end of our springtime pilgrimage to Yosemite Valley, we made a short detour for a last romantic moment among the wildflowers. About three miles outside the Arch Rock park entrance, off Highway 140, we parked and walked a few hundred yards to two foamy walls of water, Cascade and Wildcat Falls, where fragrances of mock orange and spice bush filled the air. We vowed to return to Yosemite in the fall when the sunflowers are in bloom and the bigleaf maples and aspens are trembling golden spires.